Imagine you have a form with 10 required fields on it. That's a bit larger than your average form on the internet and a good bit of work for a user. You might lose some users along the way, which is never a good thing. Perhaps to encourage finishing the form, you let them know how close to completion they are, and display motivational messages along the way. Inputs wouldn't necessarily need to be required for this demo, but it makes for a clean demo. Filling out an optional field doesn't bring you any closer to the minimum requirements for submitting a form. 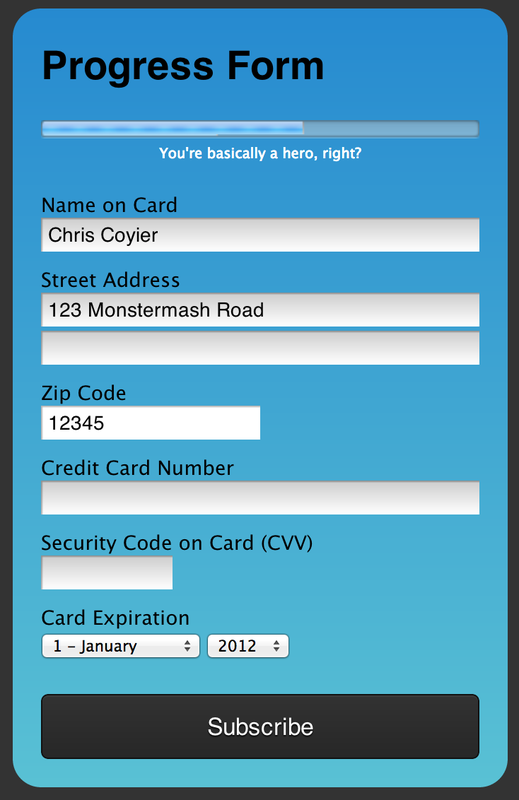 So for this demo, we'll have 5 required fields down a typical form that collects information for payment. Making the max attribute 100 means for easy math. The progress bar is as full as the value in percentage is. E.g. value="20" == bar is 20% full. No styling needed, you get this look by default (platform specific). Whether or not any particular input is valid or not in its current state is part of the DOM now. Once we have a pointer to it, we just check this.validity.valid for true or false. Now that we have an integer of how many inputs are valid, we just set up some basic logic to adjust the progress bar's current value. This is where we could also display our motivational messages. Perhaps there is a <p> element somewhere on the page which we have a pointer to (progressMessage) and we simply adjust the text inside it to match the progress. If browser support is a concern, you'll probably want to run a little Modernizr test first. If it passes, then load scripts, inject elements, however you want to handle it. // Modernizr.load, inject elements, whatever. If you need more help on that, read this article. That’s a great idea! Love that concept especially the dynamic progress bar! We’ll use that. Thanks!! I wasn’t aware of this.validity.valid, very handy. Good article as well! Pressing key isn’t the only way to change input field. You can also do it for example with drag & drop or pasting using middle mouse button in some linux distributions. I would change the trigger event to focus/blur or something. Autofill also confuses it. But I great concept once the kinks are worked out. This is a great example of progressive enhancement. It does bring up the question that will be asked: How stylable is that progress bar. I think this goes without saying but IE9 hates this. Not my code, though; comes from this SO thread, from someone named “Thomas”. I did not know there was a <progress> element in HTML. I’m surprised you don’t see this element much for ‘loading’ pages. If someone can please explain to me where the validation of this form is being handled on the demo i would appreciate it thank you. It’s in the HTML, using the “pattern” attribute. I believe the JS also checks for empty/filled inputs, to make the progress bar and messages proceed. Got it. Thank you. Will have to read up on all the new HTML5 form elements. Just be careful about Safari 5 (and Mobile Safari 5). It aggressively deletes progress elements instead of just ignoring them. You might have to test to see whether the progress element exists at all first. Setting the percentages manual is a mess. How about to add classes like “valid” if valid and change the width of the progressbar to (amount of inputs)/(valid inputs)? As many forms are accompanied by JS client validations I would consider updating the progress only after the required value is already validated (and valid). Also using an animator function as Louis mentioned would be a nice addon. The autofill could be workarounded by another event handler after the page is loaded that will walk through the fields and validate them (and as we would have our progress update hooked on validations the progress would immediately update to corresponding value).